BMW from planes, motorcycles and automobiles..
BMW started it life as a maker of aircraft engines in 1917.Its now famous BMW Roundel is not symbol of anything automotive but evokes a airplane propeller in motion. By the end of World War I BMW was forced to cease production of aircraft engines due to the terms of the Versailles Treaty. By 1923 when some restrictions were lifted the company shifted its manufacturing to motorcycles and later aircraft engines. By 1928 the first BMW automobile was produced. In the early days automobile production was far out shadowed by motorcycle and aircraft engine production. By 1959 BMW automobile division was in trouble..
BMW offered a “Turbo Diesel” in the USA between 1985-1986. The 524TD was used on the E28 platform. It had 114 horsepower and was only available with an automatic in the USA. 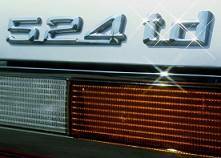 Lincoln also used the engine in their Mark VII series from 1984-1985. By late 1959 BMW shareholders were on the brink of liquidating the automotive division. A contract to build the ISO Isetta or BMW Isetta would save the automotive division from being a footnote in history. BMW would forge ahead in the 1960’s building more modern vehicles. Unlike the BMW motorcycle powered Isetta BMW’s of the 1960’s would soon feature BMW’s now famous “straight six” cylinder engine. That engine and its 4 Cylinder sibling would be the benchmark of engine building excellence for decades..
BMW had a V8 powered sports car before Mercedes Benz. Produced between 1956-59 The BMW 507 featured a 3.2 liter aluminum alloy V8. Only 252 were produced. They sold new in 1956 for $3250.00. A Kings ransom in its day. At a recent auction an original 1957 BMW 507 sold for $457,000. Not a bad mark up indeed..
BMW moves ahead from the competition..
By the late 1960’s and early 1970’s BMW were still not a common sight on American roads. With the introduction of the 2002 in 1968 and the 320i in the 1975 all that would change. BMW would introduce models to the USA like the 325i, 535i and 735i in the 1980’s. These BMW’s would solidify BMW’s strong hold in the USA. BMW thru the next two decades would increase its sales in the USA with over 170,000 Bimmers being sold here in 2008. BMW was one of the first European manufacturers to produce vehicles here in Spartanburg South Carolina.. Your BMW deserves the best in parts and knowledge that come from Euro Parts Direct parts professionals. Let Euro Parts Direct and our experienced sales staff be your first choice for quality parts for your BMW.